?We all fantasize. Whether it’s about hooking up with the girl next door or taking down the creep down the street. Sometimes we want to step in and do the right thing or simply do whatever it is we want. What happens when we take every moment and rewrite it in our heads? What happens when we can no longer differentiate between what’s real and what’s fantasy? Director Charles de Lauzirika takes a hard and violent look at what could happen we lose control of what our mind and body Crave. Crave opens with the introduction of Aiden (Josh Lawson), a freelance photographer that makes little money and obsesses about the world around him. He fantasizes about being a hero and getting the girl, hell, just getting laid seems to be something that has eluded him for some time. Aiden is lonely and dying on the inside, being swallowed up by an unforgiving city. Nothing goes his way and he simply continues to take it, until he meets Virginia (Emma Lung), that is. Virginia seems quiet and reserved at first but once she lets Aiden in, she is a hell cat who makes him feel alive! With his new found confidence, Aiden seeks to make his fantasies a reality. The problem is, not everything in our head should flow out into the world. 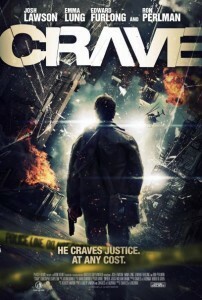 Crave is a psychological thriller with spurts of graphic violence that may surprise you. Aiden is both living a dream and a waking nightmare. The city he lives in (Detroit) is eating him alive and the pressures of day to day living begin to prove too much. He retreats into violent fantasy more and more. Guns and sledgehammers play a factor in him working out his frustrations, but they’re just fantasies, right? Lines get blurred and the thoughts in his head become spoken realities that no one wants to accept. Josh Lawson owns the part of Aiden. Turning a character that could have been wall-to-wall creepy into someone you hope will have a “happily ever after." It’s not what he says, since his words are alarming, but how he says it. It’s a controlled and subtle performance that is solid through and through. Aiden's only guidance is his friend Pete (Ron Pearlman), a cop who often offers wisdom from time to time and appears to turn a blind eye when necessary. Their relationship is as odd as the fabric of Aiden’s reality. Everything is suspect. Virginia is portrayed by Emma Lung, and she is many things at once. Part quiet loner, part sexual beast, part damaged goods. She is whatever Aiden needs to perceive her as, and in turn, what the viewer needs as well. Co-writer and director Charles de Lauzirika has fashioned a twisted tale that weaves in romance, vigilante justice, twisted murder, and the loss of sanity. The film plays as Travis Bickle wandering the streets of 2012’s Maniac in the world of Inception. It is a haunting film, both thought provoking and sad, that gives you no clear path to an end. It can be many different things depending on what you want to see or what you need it to be. Though it’s not strictly a horror film, it will disturb you, make you rethink your thoughts and the desires you have deep inside. Crave is about just that, the things we crave to make us feel complete. The things that make us feel alive. Crave is about all of us in a way, but especially the ones who get lost along the way.